The Rosewood Country Inn just put the wraps on our fourth dastardly weekend murder mystery. These events are a blast and we really do love doing them! We've worked with John Bailey with Murdermysteryweekends for all that we have done since we took over ownership of our lovely Victorian set in the mountains of New Hampshire back in 2015. It only made sense for us to do weekend live action plays with the history of the property having hosted the likes of: Charlie Chaplin, Mary Pickford, Douglas Fairbanks, Jack London, The Gish sisters, Gloria Swanson and many lesser known actors from long ago having stayed here back in the early twentieth century. Our guests and participants in the weekend long events have gotten to walk the halls, and hang out in our bar in the shadow of these famous actors and we'd like to think they approve of our continuing the acting traditions here, where these famous folks used to come to relax. Of the four themes we've hosted: 1920's Riverboat gambling, 1940's Debutante party, 1950's High School reunion, and now the 1970's Disco Dance party. All have been a absolutely amazing time, with guests coming dressed in costume: Flappers with Boa's, Gentlemen and lady socialites, Pimps, Priests and Nuns we've seen them all. And we get to decorate the Inn to help add to the weekend and illusion of your fun. We just plain like to have fun and hosting events like murder mystery weekends are one of the myriad of ways we have found to do it. Come check us out one of these weekends, or better yet, give us a shout and give us your vision of what you'd like to do to help you and your friends have a funtastic weekend at the Rosewood! You never know what you will encounter here at the Rosewood. Everyday you see chipmunks here at the Inn. What's funny is when you see chipmunks on a very windy day and they jump for there hole only to be blown off course mid-bound. This happened to one little fellow just the other day. He was surprised when a couple of humans walked up behind him and scared the guy which made him dive for his hole, only to get blown slightly off course and the poor little guy flew smack into the wall of the garage (next to his hole). He stopped, looked dazed for a moment then wandered slowly into his hole. Poor little guy luckily was uninjured but it made both the humans stop for a moment, shake our heads and then laugh out loud at his poor timing! 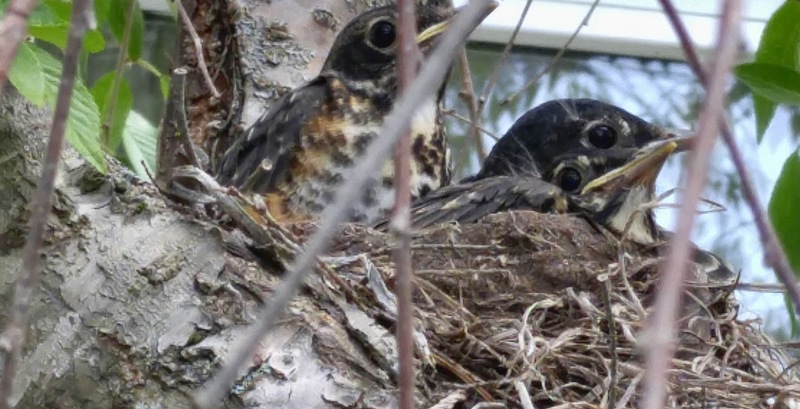 We've also had occasion this spring to catch the wonders of nature with Robin's nesting and hatching their young. This happened in a shrub/tree just outside the window of the dining room in the Inn. We could go up to a room above to see the beautiful blue of their eggs earlier, then when they hatched got to watch mom and dad feed their young chicks beak to beak. It was a great experience for our boy, and he loved it. Then, another day we opened the basement door one morning to find a cow moose just on the other side of the creek behind the Inn. She looked up and then trotted off into the woods up the hill behind us. We'd been here a year and a half already and I'd been looking all over, just to find one not 15 yards away in the backyard. 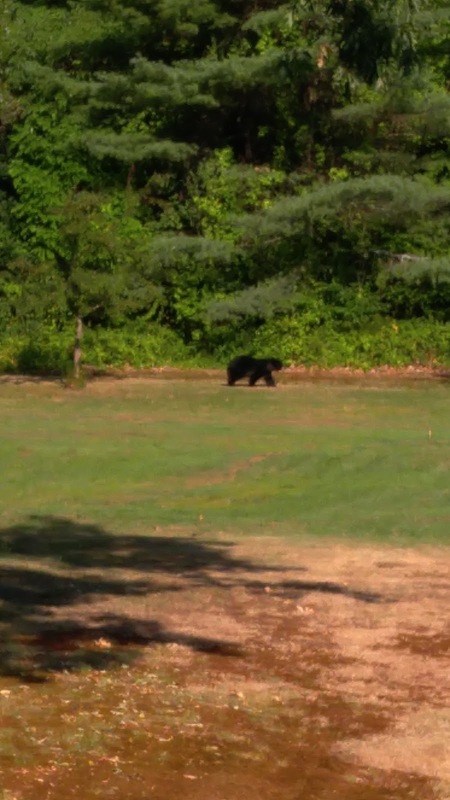 The following day, I was cooking breakfasts for our guests and our boy came briskly into the Inn kitchen and announced "Daddy, daddy I just saw a black bear!" He was quite proud of himself for catching the fellow, essentially in the same spot as I'd seen the moose just the day before. Then two days ago, our fellow whose been helping us replacing some of the siding on the side of our lovely old Victorian was up on the scaffolding. He told me he heard a commotion behind him only to find a doe jumping our stone fence along the side of the road. She stopped and waited, Dan didn't know why, then he saw it. She was waiting for her fawn to follow her. According to the description the fawn must have just been born, it was maybe 2 feet tall and couldn't possibly jump our stone fence that was as tall as it was, so he/she came around the fence and ran just below our man - not 10 feet away. Neither the fawn nor it's mother saw Dan because he was up on the scaffold, but he had a birds eye view of the wonders of nature. we love being here. We get to see the beauty of nature everyday, while still being close enough to the city's to keep us fully connected.